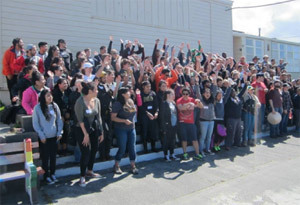 Over a hundred thirty volunteers from the YES House and the Arcata community gathered for this year’s celebration of C​ésar Chá​vez. They gathered to rejuvenate The Jefferson Project in more ways than one. Volunteers joined together in Eureka to paint vibrant colors on the stairs leading up to the doors, plant trees, renew bocce ball and basketball court lines and even take down the chain­link fencing to allow kids easier access to the playground. Gorgeous new garden boxes were weeded, mulched and are filled with spring sprouts! 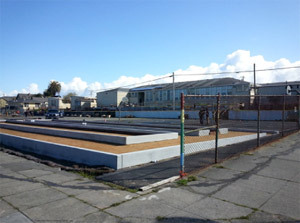 These gardens will be used to incorporate more sustainable habits to the project and teach kids about how to grow their own food. After proving a great service to this well­-deserving cause, the volunteers all sat down together to have a delicious meal prepared by fellow YES House members. Tacos, salad and strawberries were enjoyed by all while soaking up all the sunshine the day had to offer. “It was very motivational to see the difference a group of bright people can make in their community,” says SteppUp director Irene Gonzalez about the wonderful day. Like a Dance­-a-­Thon the Y.E.S. 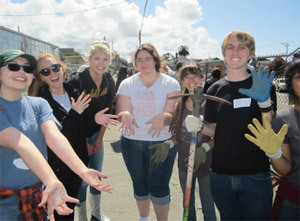 Serve­-a-­Thon annually raises funds to help sustain our quality volunteer programs. We would like to thank all the volunteers and supporters who came out to help us serve the community and donated funds so that we can continue these types of events. (If you missed the chance to donate and would like to donate to our programming, please visit our website for a link.) Overall, this year’s Serve-­A­-Thon brought about new opportunities for financial support, an amazing transformation in the Jefferson Project, and countless smiles from volunteers and recipients alike!